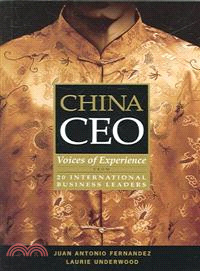 CHINA CEO: Voices of Experience From 20 International Business Leaders is based on interviews with 20 top executives and eight experienced consultants based in China. The book is packed with first-hand, front-line advice from veterans of the China market. Hear directly from the top executives heading up the China operations of Bayer, British Petroleum, Coca-Cola, General Electric, General Motors, Philips, Microsoft, Siemens, Sony and Unilever, plus expert China-based consultants at Boston Consulting Group, Korn/Ferry International, McKinsey & Company, and many more. Each chapter provides practical tips and easy to grasp models that will help new managers in China to be effective. In CHINA CEO, we deliver what other Western authors can't – first-hand reflections based on over 100 years' collective experience in China. The book presents this rich knowledge in a readable, conversational style suitable for time-constrained executives. Each chapter gives specific advice on how to manage Chinese employees, work with Chinese business partners, communicate with headquarters, face competitors, battle intellectual property rights infringers, win-over Chinese consumers, negotiate with the Chinese government, and adapt yourself (and your family) to life in China. Juan Antonio Fernandez is a professor of management at China Europe International Business School, which ranks 22nd worldwide among MBA programs on the Financial Times index. Laurie Underwood, a 14-year journalist in greater China, is director of communications and publications for the American Chamber of Commerce in Shanghai. AmCham Shanghai ranks among the two largest American chambers in Asia. Foreword: China: A Must-win Market. Chapter 1. Qualities of a Successful International Manager in China. Chapter 2. Managing Chinese Employees. Chapter 3. Working with Business Partners. Chapter 4. Communicating with Headquarters. Chapter 6. Battling Intellectual Property Rights Infringers. Chapter 7. Winning Over Chinese Consumers. Chapter 8. Negotiating with the Chinese Government. Chapter 9. Living in China.